The world's only incarcerated Nobel peace laureate will mark her 60th birthday under house arrest tomorrow, with her political party paralysed and her country deadlocked. Aung San Suu Kyi, the leader of Burma's democratic opposition, has not left her home in University Avenue, Rangoon, for more than two years, having spent almost 10 of the past 14 years under house arrest. Her birthday is being marked with events around the world, and Jack Straw, the Foreign Secretary, this week renewed his call for her release. "Her treatment by the Burmese authorities is indefensible and I urge them to release her and the 1,300 other political prisoners immediately," Mr Straw said in a statement. The Norwegian Nobel Committee yesterday made the rare move of issuing a statement on a laureate. "The reason we did it now is because it is so clearly linked to her safety and health," said Geir Lundestad, the secretary. 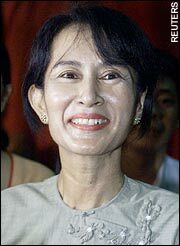 Ms Suu Kyi was attacked by a mob in 2003 and was hospitalised later in the year. The committee's statement read: "Suu Kyi's struggle is one of the most extraordinary examples of civil courage in Asia in recent decades. That was true in 1991. That is even more true today." In Burma, the occasion will pass quietly, with small gatherings confined to the homes and offices of members of the National League for Democracy. There is a permanent police presence outside her home and requests for a foreigner to be driven past the building are met with either a regretful smile, or open laughter. "It's not possible," said one driver. "Dangerous," he added, crossing his wrists to indicate the probability of arrest. It was a comment typical of a country where politics are never discussed openly and five people have just been sentenced to life imprisonment for distributing opposition pamphlets. Freedom from fear, to quote the title of one of Ms Suu Kyi's books, seems more distant in Burma than it has for years, and at the same time questions are beginning to be raised about the approach of her NLD. The league won elections in 1990 by a landslide, but has never been allowed to take power by the ruling military. It has refused to take part in a national convention assembled by the generals to rubber-stamp a constitution. The State Peace and Development Council, as the junta calls itself, appears content to maintain the status quo, with the country an international pariah and its people impoverished. But with no sign of compromise from the military some believe that the NLD should seek to engage the authorities. "The NLD are in utmost opposition to the government," said a journalist in Rangoon. "This military regime, all the bad things are there. Then what? "Is it possible to kick them out, or is it time to seek co-existence?" he asked. "As far as I understand the NLD is expecting surrender from the government, which is totally impossible. They will not just go back to their barracks." He suggested that some form of power-sharing, with democratic forces playing a role in government was needed to reassure the military that it would have a place in a non-totalitarian Burma, before democratisation could happen. But he did not expect that any time soon. The NLD's current leadership is made up of elder statesmen in their 80s and the journalist said that they had proved too dogmatic. Ms Suu Kyi, the daughter of Burma's independence hero Aung San, is isolated to the point of being unable to get messages out of her home. Even while she is locked into the house, Ms Suu Kyi's status remains undimmed. "Everybody likes the lady," said one Burmese.